"I did not come to be served but to serve (see Matthew 20:28), says the Lord. Those who are placed over others should glory in such an office only as much as they would were they assigned the task of washing the feet of the brothers. And the more they are upset about their office being taken from them than they would be over the loss of the office of [washing] feet, so much the more do they store up treasures to the peril of their souls (see John 12:6)"
(Francis of Assisi, Admonition IV). Benedict held important posts in the Franciscan Order and gracefully adjusted to other work when his terms of office were up. His parents were slaves brought from Africa to Messina, Sicily. Freed at 18, Benedict did farm work for a wage and soon saved enough to buy a pair of oxen. He was very proud of those animals. In time he joined a group of hermits around Palermo and was eventually recognized as their leader. Because these hermits followed the Rule of St. Francis, Pope Pius IV ordered them to join the First Order. Benedict was eventually novice master and then guardian of the friars in Palermo— positions rarely held in those days by a brother. In fact, Benedict was forced to accept his election as guardian. And when his term ended he happily returned to his work in the friary kitchen. In later life Benedict was not possessive of the few things he used. He never referred to them as "mine" but always called them "ours." His gifts for prayer and the guidance of souls earned him throughout Sicily a reputation for holiness. Following the example of St. Francis, Benedict kept seven 40-day fasts throughout the year; he also slept only a few hours each night. After Benedict’s death, King Philip III of Spain paid for a special tomb for this holy friar. 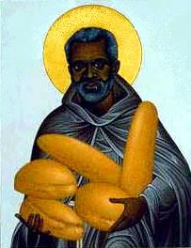 Canonized in 1807, he is honored as a patron saint by African-Americans.